Get more from your floor. Epoxy flooring provides a floor surface that’s attractive, super-durable and very easy to clean. Photo courtesy of Dur-a-Flex. Scholar Painting provides Free Estimates for epoxy flooring installation in Greenwich, New Canaan, Darien, and nearby. Contact us today! When you contact Scholar Painting about epoxy floor coating, we’ll come to your home or building to provide you with a free floor inspection and epoxy floor finish estimate. Our expert technicians can help you decide if epoxy flooring is a smart choice for your particular application. 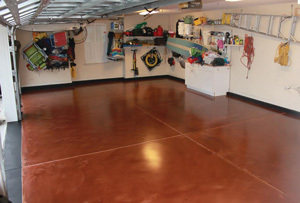 If you decide to go ahead with an epoxy garage floor or any epoxy flooring installation, you can select from a variety of colors and decorative treatments to make your floor look great. Before installing your new epoxy flooring, we’ll first clean your existing floor and make any necessary spot repairs. Then we’ll make sure that temperature conditions are right before mixing and applying the epoxy finish. We are the area's expert painting contractor, serving New Canaan, Greenwich, Darien, Riverside, Old Greenwich, Stamford, Weston, Westport, Cos Cob, Wilton, and nearby!